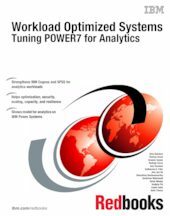 This IBM® Redbooks® publication addresses topics to help clients to take advantage of the virtualization strengths of the POWER® platform to solve system resource utilization challenges and maximize system throughput and capacity. This publication examines the tools, utilities, documentation, and other resources available to help technical teams provide business solutions and support for Cognos® Business Intelligence (BI) and Statistical Package for the Social Sciences (SPSS®) on Power Systems™ virtualized environments. This book addresses topics to help address complex high availability requirements, help maximize the availability of systems, and provide expert-level documentation to the worldwide support teams. This book strengthens the position of the Cognos and SPSS solutions with a well-defined and documented deployment model within a POWER system virtualized environment. This model provides clients with a planned foundation for security, scaling, capacity, resilience, and optimization. This book is targeted toward technical professionals (BI consultants, technical support staff, IT Architects, and IT Specialists) who are responsible for providing Smart Analytics solutions and support for Cognos and SPSS on Power Systems.